The first combat submarine to sink a warship was the H.L. Hunley, part of the Confederate States of America’s navy in the Civil War. The Hunley sank the Union sloop USS Housatonic near Charleston Harbor on the night of Feb. 17, 1964. Unfortunately, the Hunley never made it back to shore. The vessel, with all eight men aboard her, was lost. The wreck was not found for 131 years, when it was discovered in 1995. Sepia wash drawing of the Hunley on the pier, by R.G. Skerrett, 1902, after a painting then held by the Confederate Memorial Literary Society Museum, Richmond, Virginia. Public domain. The H. L. Hunley was not the first submarine, but it is believed to be the first to sink an enemy ship. It was built in Mobile, Alabama, and launched in July 1863. Its first run in Mobile Bay was successful. It was shipped by rail the following month to Charleston, S.C. Designed for a crew of eight, it had a hand-cranked propeller which was turned by seven of the men. The eighth crew member steered. On each end of the craft were ballast tanks that could be flooded using valves or pumped dry by using hand pumps. These enabled the submarine to submerge and surface when the crew desired. Inboard profile and plan drawings, after sketches by W.A. Alexander, who directed her construction. Extra ballast was provided by iron weights on the hull. These could be unscrewed from inside and dropped, if extra buoyancy was needed. Forty feet long and four feet, three inches high, the Hunley had two hatches, one toward each end of the hull. Some folks described the sub as looking like a fish, a porpoise, or a peapod. The weapons called torpedoes at the time were floating explosive charges with a contact fuse, towed at the end of a long rope. This was what the Hunley was originally armed with. The procedure for attacking an enemy vessel was to approach on the surface, then dive under it and resurface on the other side. When the torpedo on the end of the rope touched the hull of the enemy ship, it would explode. This method proved very dangerous, since the tow rope could get caught in the submarine’s screw or drift into the submarine towing it. So it was scrapped for a new method. A “spar torpedo” was attached to a 22-foot-long wooden spar, sticking out at the front of the submarine. The torpedo was a copper cylinder full of black powder. Using this weapon, the Hunley had to be at least six feet below the water’s surface. It would run up to the enemy ship and ram it with the barbed end of the torpedo. In theory, at least, the submarine would then back away, leaving the torpedo in the ship’s hull. The trigger setting it off would be released mechanically by a cord. However, in the wreckage a spool of copper wire and a battery were found, which leads some investigators to believe an electric detonator had been devised for the last voyage. 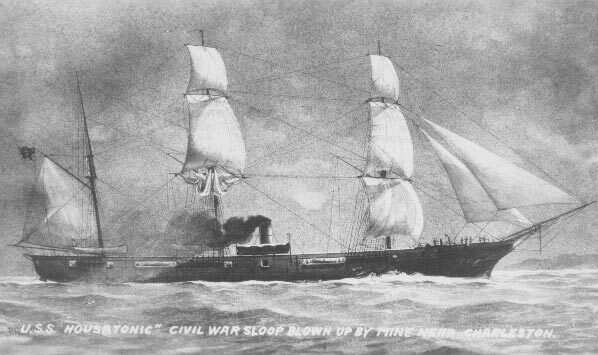 This is USS Housatonic, the ship sunk by the Hunley. Public domain photo. The submarine Hunley sank during a test run on August 29, 1863. Five crew members died. On October 15, she sank again. This time eight men aboard died, including Horace Hunley, the man who designed the craft. After both of these sinkings, the Hunley was recovered and placed back in service. The men serving on her knew the dangers, but they believed the flaws had been fixed and the submarine was now safe. The USS Housatonic was a 1,240-ton sailing ship that had been on blockade duty in the outer harbor at Charleston. It was a sloop of war with 12 large cannons. When the Hunley attacked, the much smaller submarine was successful, and the ship sank. Hunley approached underwater, so that the men on the Housatonic would not see her. When the submarine was spotted, crew on the ship fired rifles and shotguns at it, with no effect. The spar torpedo at the en dof a 16-foot rod struck the ship near its powder magazine and exploded. Within minutes, the Housatonic was lost, but only five of the 155 crew members died. Most were able to board lifeboats or swim to shore. the ship went down in 27 feet of water in the harbor, so some climbed the rigging, which stayed above the surface, and remained above water until rescued. However, the Hunley didn’t make it to shore. Confederates waiting for her said they saw her signal light after she torpedoed the Housatonic. However, the submarine and the eight men aboard her never beached. Again, eight men were lost. Much more can be read about this historic battle and its aftermath. 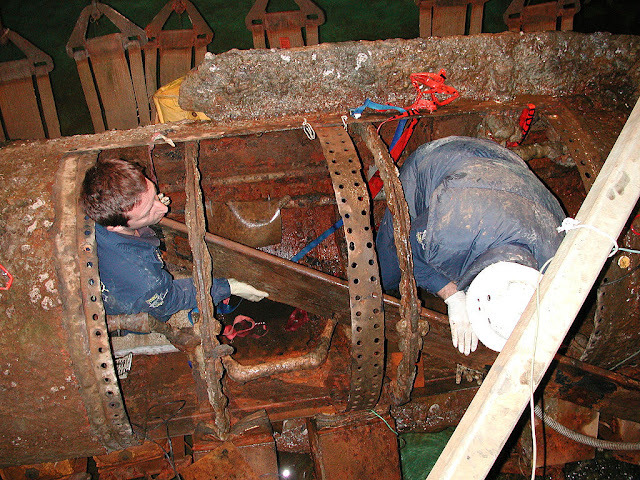 Charleston, S.C. (Jan. 28, 2005) – Civil War Confederate submarine Hunley conservators Philippe de Vivies, left, and Paul Mardikian remove the first section of the crew’s bench at the Warren Lash Conservation Lab in the former Charleston Navy Shipyard, S.C. Photo courtesy of Naval Historical Center, public domain. The wreckage of the Hunley was not found until 1995. It was raised in 2000, and is on display in North Charleston, S.C., at the Warren Lasch Conservatoin Center. The crew was buried with honors. The cause of the loss is not known for sure, but in that day, torpedoes were fixed to the submarine, not fired from a distance as they are today. Recovered artifacts confirm that the Hunley was within twenty feet of its prey when it attacked the Housatonic and the torpedo exploded. Damage from that blast possibly weakened the submarine's seams so that the crew could not stop the water that rushed in. Leave a comment and you will be entered in a drawing for one of Susan's novels, Frasier Island, which includes a submarine very different from the Hunley. If the winner has read this book, another book of choice may be substituted. Susan Page Davis is the author of more than seventy published novels. A Maine native, she now lives in western Kentucky. Visit her website at: www.susanpagedavis.com where you can sign up for her occasional newsletter, enter a monthly drawing for free books, and read a short story on her romance page. Photos used here are the works of sailors or employees of the U.S. Navy, taken or made as part of that person's official duties. As a work of the U.S. federal government, the images are in the public domain in the United States. Susan, a terrific and informative post. Living in a submarine would be an experience and difficult for many. I would like to go inside a submarine and explore around while in port. Frasier Island will be a great read for this summer. Thank you for the giveaway and all the research you've done for this post. Susan, I love reading about the Hunley and those brave men. We live in SC and have go to Charleston, my favorite city, often. Or used to anyway before life got to busy. It's an amazing story of bravery. Thanks for sharing! Thank you, Debbie. Charleston is on my list of places I'd like to visit. Thank you, Bennie! I'm glad you like that series. If your name comes up as the winner, you can choose one of my other books if you'd like. Thank you for your interesting post, Susan. It is always such a pleasure to visit here and learn. Thanks for coming by, Melanie! What an interesting post, Sue! Your research details make things come to life. I've been on a submarine but sure wouldn't want to sail in one....as opposed to my son who would love the opportunity but is too tall! Frasier Island is the best....whoever wins will love it! I have read it already (several times) but would love to get one of your other books as they are all fantastic! Oh, Nancy! If one of my kids was on a submarine I'd probably worry all the time. Thanks for your kind words. Great post! It always amazes me what you and your fellow writers come across in your research! I'm here to pick the winner, but no one left their contact information. The first commenter to leave their info will hear from me and win a book. Thanks everyone who participated! Yay! Thanks, Marilyn! I was feeling very lonely. You get the book. I'll contact you privately.